Elon Musk decided to go on Joe Rogan’s podcast, where he checked out Joe Rogan’s swords, talked about his plans for an electric plane, and smoked weed on camera after being offered it by Rogan. Rogan’s podcast, filmed in Rogan’s garage, is insanely popular, and Rogan is well known for his enthusiasm for drugs, particularly psychedelics. About an hour later, Rogan lights up a blunt and offers a hit to Musk, who accepts. And it must be said: Musk smoking weed is pretty funny. “Is that a joint or is that a cigar?” asks Musk earnestly as Rogan lights up the blunt, which causes Rogan to laugh. “You probably can’t [smoke] because of stockholders, right?” says Rogan, which seems to be enough to goad Musk into taking a hit. 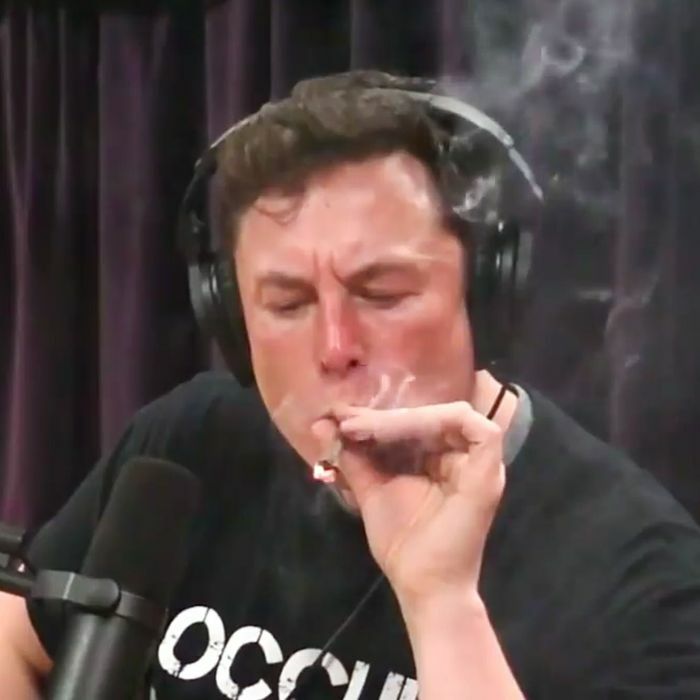 Musk then pulls the classic nerd trick of not inhaling, instead just holding the weed smoke in his mouth briefly and puffing out with his lips. Another classic Musk Meme Moment! We’re hardly ones to tsk-tsk someone for engaging in entirely legal behavior (recreational pot use is legal in California), but Musk’s appearance came just three weeks after Musk told the New York Times he was working 120 hours a week (or more than 17 hours a day). Yet Musk still took time to travel to Joe Rogan’s garage in Bell Canyon and chat for two-and-half hours. Doing Rogan’s podcast was probably good for the intense cult of personality around Musk; one imagines the Venn diagram of Elon Musk fans and Joe Rogan fans is overlaps pretty well. But his appearance likely didn’t do much to boost investor or shareholder confidence in a CEO seen as increasingly erratic, or do much to help out Tesla, a company that will likely need to find new ways to raise money to continue to survive as it continues to struggle to produce enough cars to meet demand.